Bakuchiol, Benzalkonium Chloride, Bisabolol, Caprylic/Capric Triglyceride, Cetyl Alcohol, Chamomilla Recutita (Matricaria) Flower Extract, Cocamidopropyl Betaine, Disodium Laureth Sulfosuccinate, Ethylhexylglycerin, Farnesol, Phenoxyethanol, Glycerin, Glyceryl Stearate, Isobutane, Magnesium Aluminum Silicate, Methylisothiazolinone, Naringenin, Panthenyl Triacetate, PEG-100 Stearate, Polyethylene, Propane, Sea Whip Extract, Sodium Benzoate, Stearic Acid, Water, Xanthan Gum. Really kills bacterial that causes acne, saw a difference within 2 day.s Only slightly drying, not too much I begin with a gentle cleanser to remove make-up, then use this cleanser. The Benzoyl Peroxide makes a huge difference on my skin (unlike salicylic acid which does nothing for me). I have also been using their after care night foam. This regiment has made an amazing difference on my skin. It is the only 2.5% wash I've seen in stores. 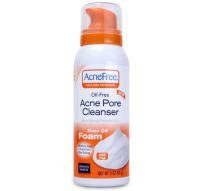 It works well Doesn't remove makeup I had been eyeing this for awhile because every face wash I tried was giving me clogged pores and little pimples. I'm doing the regimen and no gentle wash or other washes worked for me. I saw this on sale so I finally caved in and bought it. I'm so glad I did! My bumps are almost gone now after only a week. I use this in the pm before applying dan's bp and a different wash in the am that has glycolic in it. The only issue is that I don't think it removes makeup, but most cleansers don't. When I wear makeup I use baby wipes before washing with this.